Image is the dominant medium of all communications, which extraordinaire and innovative artist Yuliya uses to express the complexity and beauty of art. Yuliya had mastered the fundamentals of art at Kyrgyz National College of Art where she had earned Master Degree in Fine Arts at age of 18. Now she delighted to present her work on American soil. Yuliya’s drawings are characterizing by enormous variety in terms of technique, subject matter and innovative designs. Exercises in rendering three-dimensional objects by exertion into pure imagination she demonstrates extensive, authentic and at the same time innovative graphics. Whether she sketches with pen or air brush she creates images that belong more to imaginary realm of poetry than the raw reality of life. ...."a rising star painter by name of Yuliya ... She walked through the door of my shop and wanted to lern how to airbrush. Already an accomplished artist, no one would teach her.... 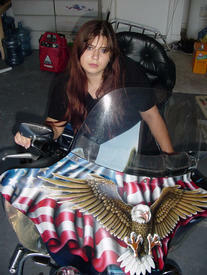 This is the first custom bike paintjob she's ever done and now she's booked up for months." ...For nearly three weeks, Yuliya worked on the mural. A job was definitely a labor of love.